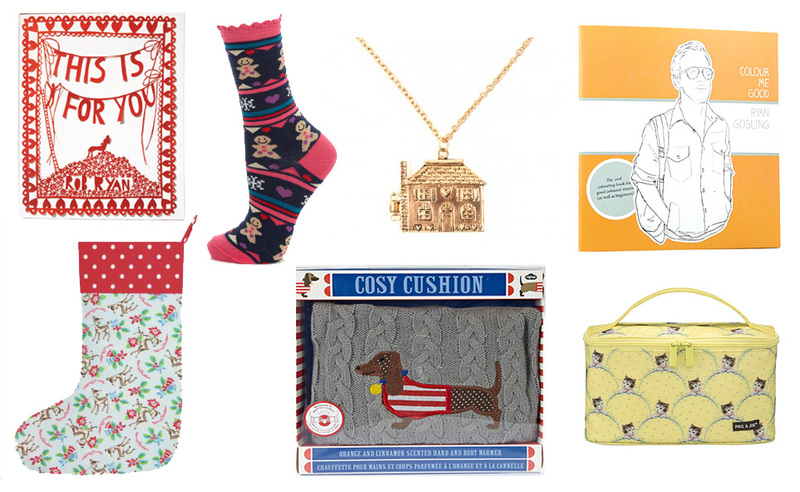 For my secret Santa gift guide I've tried to choose items which aren't too pricey and I feel I've done pretty well, the cheapest is £3.50 and the most expensive item £22.50. These are all presents that I would love to receive myself so hopefully you do too! 1. - Rob Ryan - This is for you (14.99) I think that this would make such a gorgeous gift, I don't know any girl who doesn't love his illustrations. This book is an amazing price and would be such a perfect girly gift to give someone this Christmas! 2. - Gingerbread socks (£3.50) As you get older it seems slightly unacceptable to go walking around with big pictures of rabbits on you skirts (which seems very unfair.) So I think having lots of silly socks like these are a nice way to show your young side without anyone having to know. 3. - House Necklace (£15) This necklace from Joy is so cute with its tiny chimney and heart shaped windows but it has a secret Once you open up the locket it shows you all the rooms (with sofas and wall art) inside which is such a nice detail to have. I love this necklace so much and I think the length is perfect. 4. - I love Mel - Ryan Gosling colouring book (£7.50) It's a Ryan Gosling colouring book! Do I need to say anymore? 5. - Cath Kidston - Deer & Spot stocking (£12) This stocking is so adorable with its kitsch deer and spotty patterns, the baby blue also makes a nice change from the usual festive colours. I was lucky enough to be bought this by my boyfriend and I am in love with it! It's much bigger in real life than you would think but I'm very much looking forward to putting this at the end of my bed on Christmas Eve. 6. - Sausage Dog cosy cushion (£15) I've recently become quite obsessed with sausage dogs and it would appear that many shops have too as there are sausage dog goodies everywhere, but this may have to be one of the best things I've seen. It's a cosy cushion with a sausage dog applique, but it smells like orange and cinnamon which is a perfect scent for this time of the year, and it will keep you nice and toasty. 7. - Kitten vanity case (£22.50) Paul and Joe seem to be able to do no wrong in my eyes, I first came across them when they released their cat lipsticks, (mine is still in pristine condition, I don't want to ruin it!) So when I came across this I knew I had to include it. I'm not usually a fan of yellow but this seems to work perfectly with the vintage kitten print, the shape is great, making it not only look great but it's very practical too! I'll definitely be putting this one on my Christmas list. I had so much fun making this post and I hope you enjoyed it too!